Merry Christmas! 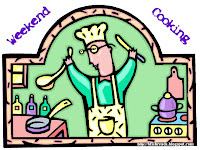 Thanks to everyone who has helped make Weekend Cooking so much fun over the last year. This is my 62nd Weekend Cooking post. I don't know about you, but I get a ton of food magazines. I subscribe to several titles and I pick up others at the grocery store or bookstore when something on the cover catches my eye. Unfortunately, magazines can quickly take over my house. The good news is that one of my favorite winter projects is to organize my recipes. The first step is to tackle the pile of magazines, the bulk of which are food or wine related. Please tell me that I'm not the only one with a stack like this. 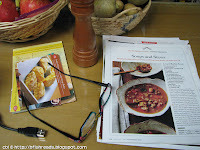 While I'm going though the issues, I rip out any recipes or articles that I think I may want to save. I'm not very discriminating at this stage, and I usually end up with a rather intimidating mountain of paper. Once the magazines themselves have been ransacked and set out for recycling, I go through the recipes more carefully, saving only the ones I might really make and deleting the duplicates. Then it's time for organizing. These days, I use small notebooks. I've had many systems over the years but the notebook rings and paper punch I bought from Levenger have allowed me to create my own cookbooks of a variety of thicknesses. They are also very easy to organize and open flat. The system can be costly, so I use a variety of paper and dividers (some leftover from various day planners I tried in the past) that I convert to the Circa system with a special paper punch. I also have collected my supplies over several years, so I didn't make one huge purchase. During the January nights when I add new recipes to my notebooks, I also take some time to look through the old ones, throwing out any that no longer appeal to me. Because I glue only one recipe to each page, it's easy to get rid of individual recipes and to re-categorize when the mood hits. 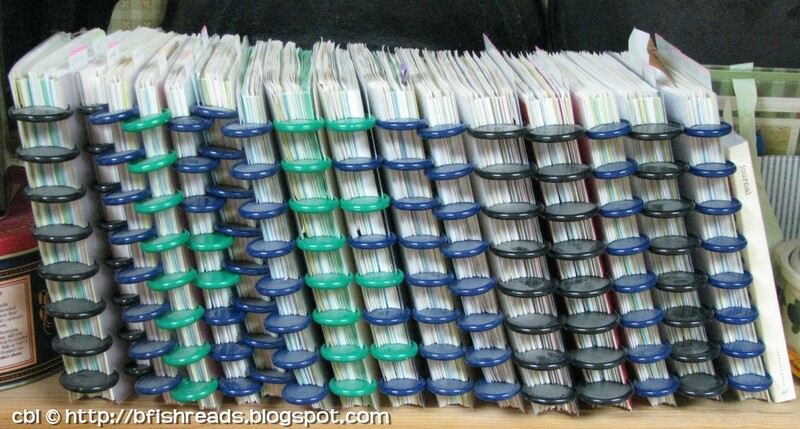 I also keep one larger three-ring binder I use for saving entire magazine articles. The only other system I use (not very faithfully) is Master Cook, a software program. 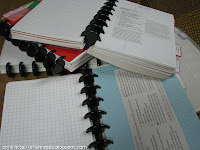 I guess I'm just a bit old-fashioned, however, because I tend use my notebooks more than I use my virtual cookbooks. Wish me luck as I begin my yearly tackle-the-magazines venture. New Year's Day is filled with lots of food in this house too. Hope you and your family have a fantastic new year. I like the idea of organizing (and editing) recipes in the notebooks. At this point I subscribe only to Martha's little magazine: Everday Food. I go to the internet a lot. So many good resources there. Right now, I have a drawer in my kitchen with loose recipes. I may pick up a blank notebook or two and organize them! I love the Circa system (I drool when I get the Levenger catalog). I use it for my reading journal. After I post a book on-line, I move its page to another journal, along with any other info like challenges that ended (each gets its own page for notes). It frees up space in the working journal for more blank sheets and "scratch paper". I can organize by the order I read the book or alphabetical by author. I love it. 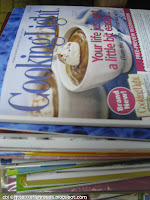 I have stacks of cooking magazines, bird magazines, garden magazines... I keep them in case I want to find an article which of course I can never find! I used to rip articles out and put them in a notebook. Now I scan them and store them in the computer and print them when I need them. And then end up putting them in the notebook. It's not the most efficient, I need a better way. You are much more organized than me. No weekend cooking for me today... I'm off to a family dinner where someone else will do the cooking! I'm totally impressed by your organization! I have a 3 ring binder that I put all of my magazine recipes in. When I make a recipe and I deem it good enough to make again (and it has to be amazing to make again since I have so many un-made recipes) then I'll print it out on a 4x6 card and put it in my permanent file. Pretty soon though, I'm going to have to create my own cookbook from one of those online cookbook creators because even my permanent recipe file is getting overfilled. 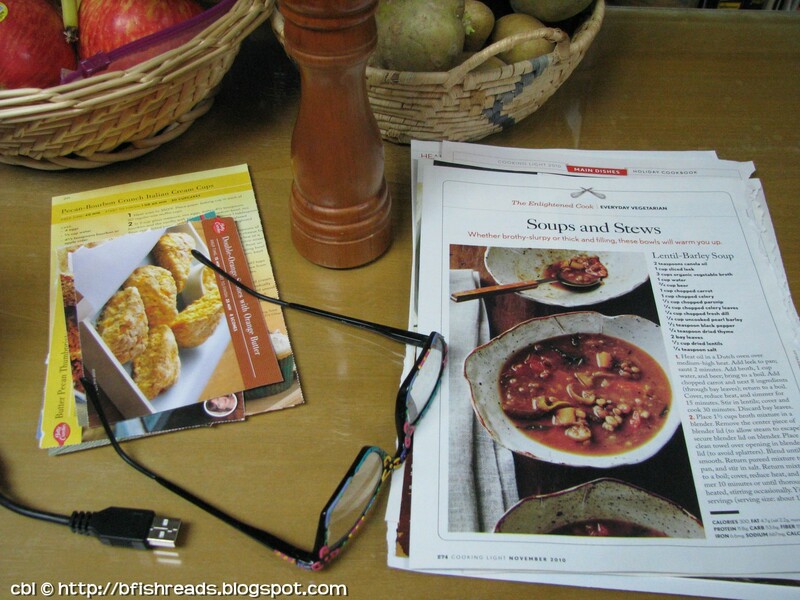 BK (before kids) I used to subscribe to several different cooking magazines and strived to make at least one recipe from each magazine each month. However, children changed all that. Now I tend to only purchase Christmas editions and pour through the recipes from Thanksgiving to New Year's. Some day I hope to rekindle my gourmet interests of years ago. I hope you have a lovely Christmas celebration and a joyous New Year! Wow - you are organized!! That home-binding system could be used for so many things ... I'm starting a wish list. I keep my magazine cut-outs in 3-ring binders (after they've been tested; they stay in file folders until then). I used to use MasterCook, too, but it's old software and clunky now. I liked that it was so easy to print/email a copy for a friend. Good luck with your New Year's project -- maybe you'll inspire me to tackle this project,too. I am going to live vicariously through your organization! I can't even go there yet! LOL! Wow!! I just cut out the ones I like, and put them in a recipe box under their own category. I recently spent the big bucks and bought four wooden boxes which I love. Now that I know about your weekend cooking, I'll try and participate more often! It's such a fun thing. I'm the opposite of you....I tend to go to my virtual online files first and then go strolling thru paper files. One of my favorite magazines "Cooking Light" puts out an annual volume, which is much more time/cost effective than making new notebooks. I order the latest one (in fact, I often suggest it as a gift to anyone who asks 'what do you want?' and then I give the years issues to one of my sisters, my mom, or one of my nieces. Great way to keep all the recipes AND recycle. A great idea for mid winter which for me is mid year. I like your organizational system for loose recipes! I got a gift subscription for Cooking Light and I hate to admit I have a pile to look through. I am going to go through them and pick out the ones that I am interested in and file them away. I may just get a 3 ring binder and plastic sleeves. I could tape the recipe on a paper and slide it in the sleeve. I've found packs of the plastic sleeves at the dollar store which is an economical way to go. I plan to organize another binder for worksheets for my students. Very organised! I have all my loose-paper recipes in a Mac Book program but I now moved to a Windows laptop so I need to find a new program. There is something fun about browsing through books full of recipes, though. now i'm all for organizing--i love to do it--but your system for magazine recipes faaaar surpasses my own. currently, i have 2 recipes i've been dying to try and the recipes have been magneted to the side of my fridge for two years. yes, two years. (one from real simple for a cranberry mousse pie and one from MStewart for maple sugar cookies) i have a large rattan basket in my living room filled to brimming with foodie and other magazines. every few months i go through and purge it. i never really thought to organize the recipes and toss the magazines, though. thanks for the idea!